ORANGE, MA (KTRK) -- This isn't your typical dog rescue. It's more like a story you would see on the classic show, "Lassie." One dog coaxed an Orange, Massachusetts, police officer to another dog that was stuck down an icy embankment. The owner of the dogs suffered a medical emergency and had to go to the hospital. Police say the woman had two terrier type dogs who were outside and ran off when officers arrived. A few hours later, an Orange police officer drove through the neighborhood again, hoping to spot the dogs. One of the dogs ran up to him, barking. Police said the dog insisted that the officer follow him through a field to an embankment. The officer saw that the second dog had slid down the ice, approximately 30 feet down to the bottom, and was wedged in some overgrowth. The officer called the fire department. 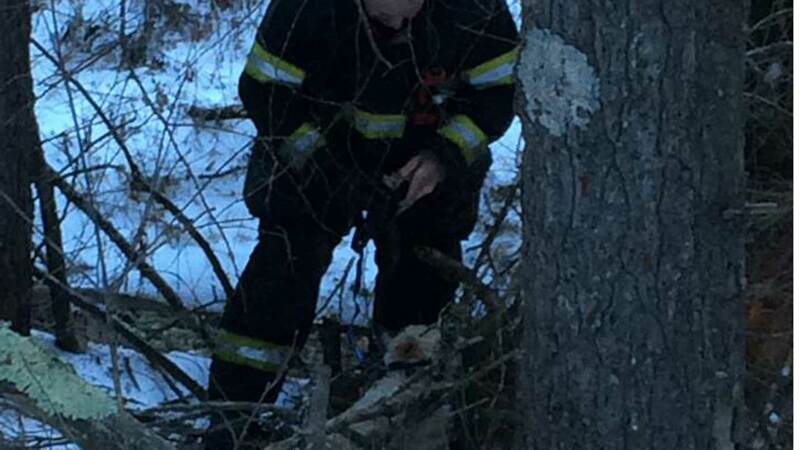 Firefighters used a ladder to go down the embankment and rescue the trapped dog. Both dogs were taken by animal control to the veterinarian to be checked over. "Apparently, any dog in the right circumstance can turn into Lassie," police posted on Facebook.